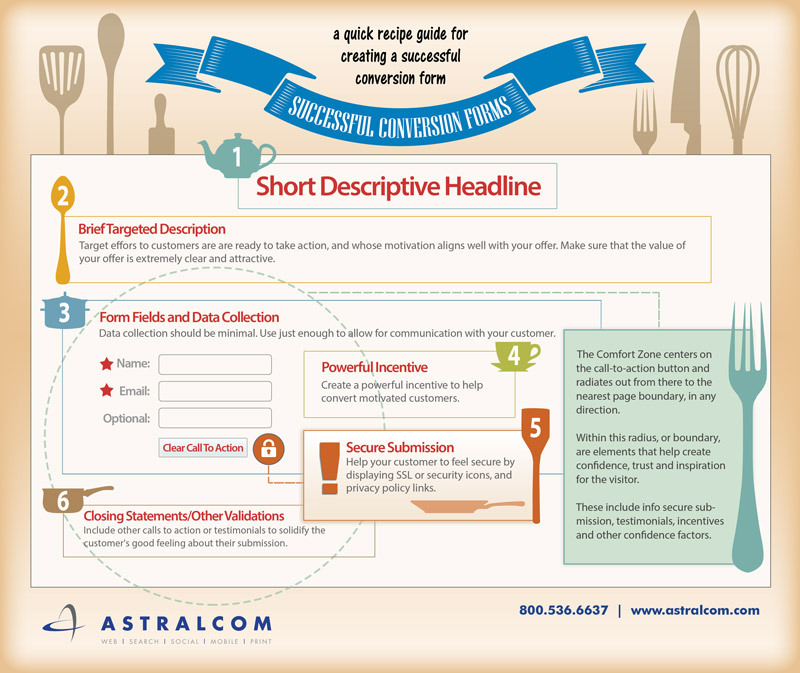 How to Create a Successful Conversion Page | ASTRALCOM - Content Strategy, Conversion Marketing and Customer Acquisition. Design aspects aside, there are indeed a set of required elements that must be present – and present in relation to specific other things – within a successful conversion page. We know from experience that with the right organization of elements on a landing page, you can produce conversions in the double-digits – even into the 20% range. Our Creative Director, Jewell, created this infographic to help show where and how things should be positioned. 2. Brief Targeted Description – Target efforts to customers who are ready to take action, and whose motivation aligns well with your offer. Make sure that the value of your offer is extremely clear and attractive. 3. Form Fields and Data Collection – Data collection should be minimal. Use just enough to allow for communication with your customer. 4. Powerful Incentive – Create a powerful incentive to help convert motivated customers. 5. Closing Statements/Other Validations – Include other calls to action, or testimonials to solidify the customer’s good feeling about their submission. Note the arrangement of specific elements within the comfort boundary. This is critical for creating trust and confidence with your site visitors and for generating conversions. If you want help in creating successful conversion form pages, reach out to us and you’ll be glad that you did.